nd85 has no other items for sale. 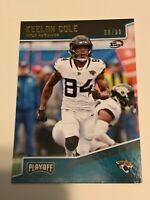 2018 Panini Elite Fred Warner AUTO RC, Draft Picks SP #/75, Cougars, 49ers! Free shipping on all eligible items from nd85. $0.00 shipping for each additional eligible item you buy from nd85. Sales tax may apply when shipping to: IA*, MN*, MO*(9.613%), WA*.